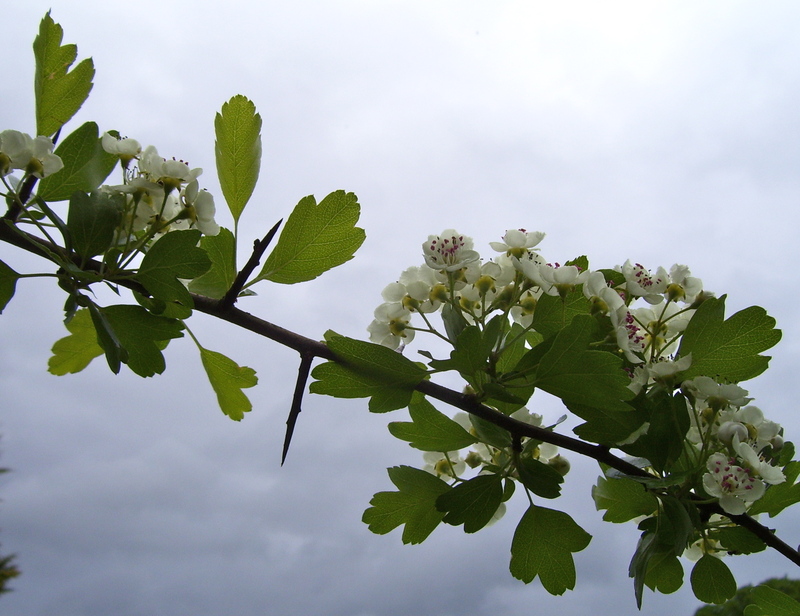 Last week I noticed that our little hawthorn is blossoming at last. White hawthorn blossom can be spotted easily along the roadsides at this time of year, where it is common as part of mixed hedgerows. Around the castle, though, we don’t have much, just one young tree planted by the tractor shed. So characteristic of the season of Beltane are they that these beautiful and abundant blossoms are known by the month in which they bloom. Hawthorn is the May tree; this is May blossom. When I was a teenager at a girls’ school, we’d all (giggling a bit) follow the ancient tradition of trying to bathe our faces in dew from the blossoms on May morning, so as to become miraculously fair of face. More often than not, however, the hawthorn was still in tight bud, which may explain why I never did become a supermodel. The blossoms themselves, on the other hand, are incredibly pretty. They look just how blossom should look, somehow. Yet they are weighed down with dark superstition. Hawthorn blossom gives out the same smell as decaying bodies, and used to be strongly associated with death. There was a taboo against bringing hawthorn into a house for fear of bringing death into the house along with it. The tree also has unchancy associations with fairies: an old Scottish legend, for example, tells how Thomas the Rhymer, the 13th Century seer of the Borders, unwittingly spent seven years underground after meeting the Queen of the Fairies beside a hawthorn tree. There are swathes of legends surrounding the hawthorn, in fact. 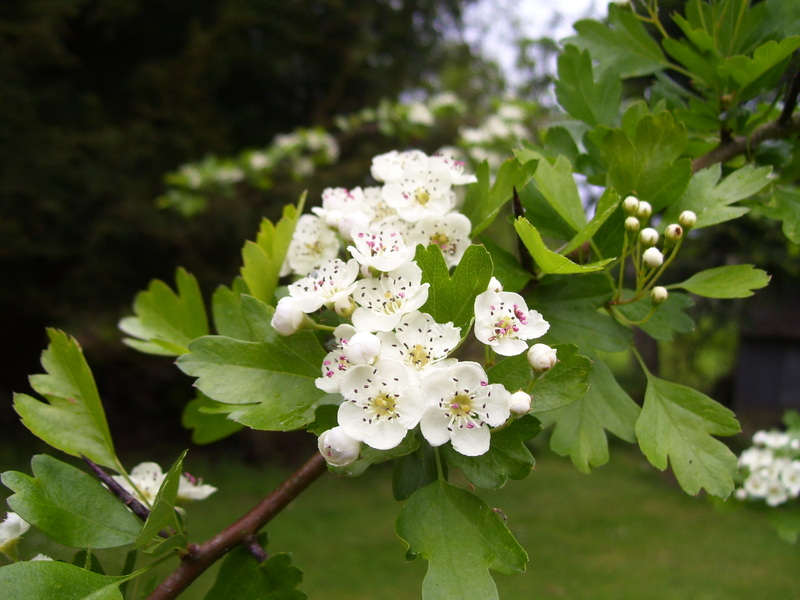 This is a brief post today, but if you are interested I’d strongly urge you to have a look at the Trees for Life entry about hawthorn, where you will find lots of intriguing information, including the associations with Glastonbury and the disciples of Christ. Elsewhere, I have even read a theory that the Crown of Thorns was made from hawthorn. Notwithstanding all these dark associations, hawthorn is also a useful and generous little tree. Its leaves can be eaten, its blossom used for medicinal infusions, its blood-red berries cooked in jellies, its wood used for carving and the plant as a whole used for hedging. At the wise blog Whispering Earth, Lucinda the herbalist has lots more to tell you about this most common and uncommon tree. Gorgeous photos of some of my favourite blossom, despite the scent. Hawthorn also makes really excellent firewood as it is very hard and lasts well, as well as giving lots of heat. When we prune our hawthorn hedges we always save the cuttings for use in the log-burner over winter. Mind you, we have to use gauntlets to stoke the fir,e as hawthorn has some of the most vicious thorns I know – quite suitable to make a crown of thorns. I’ve only just found about the exceptional qualities of hawthorn as firewood, but I don’t think we can use it anyway as there just isn’t enough about. We are lucky though, to have a plentiful supply of ash logs, which are probably the next best thing – and don’t have thorns! I think you are the owner of the images above? Please could I request permission to use one of them for the cover of our May parish magazine. We want to use the hawthorn in bloom and the third image above looks just about perfect! We would, of course, acknowledge your copyright. Thank you for asking permission to use one of my photos. I very much appreciate it! Yes, please use it if it suits your magazine. A wee mention of http://dancingbeastie.com would be great if you should go ahead with printing the photo. Ne’er cast a clout till May is oot! 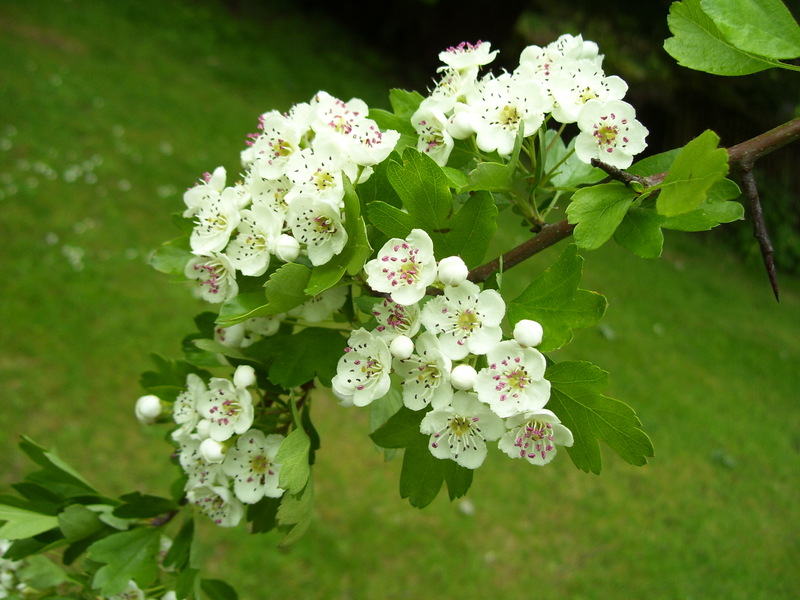 Apparently that refers to the May Flower (Hawthorn)…. so I can dispense with my vest now it’s in bloom can I? 😉 It has such beautiful blossom and I so enjoy seeing it, whatever it’s negative connotations! Yes! Kit off, everybody, it’s going to get warm now! 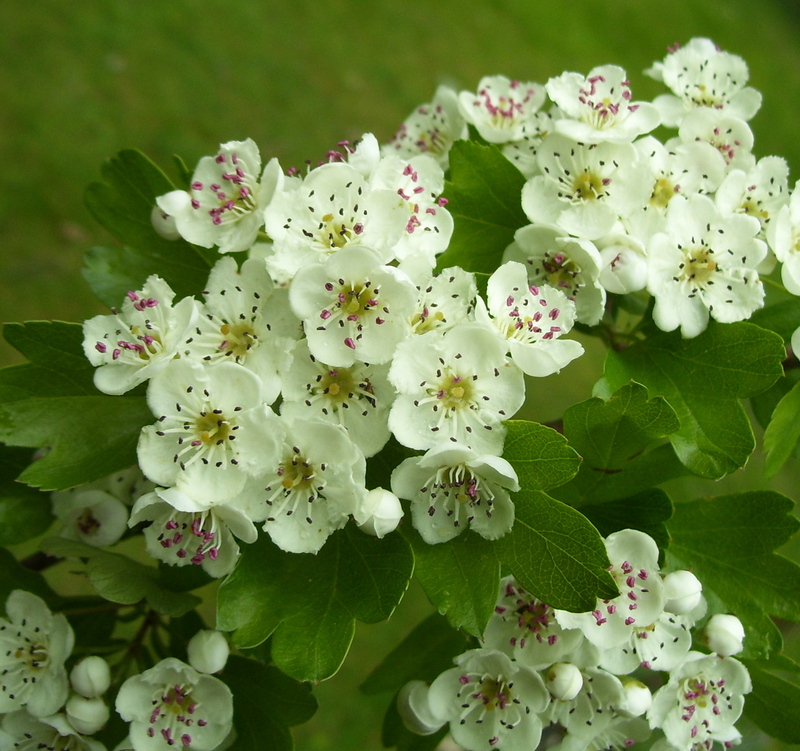 I too think hawthorn is lovely, and a treat to see in blossom or in the autumn, covered in those glowing red haws. I have been hanging out by the Hawthorns for a while now but I have yet to meet the Queen of Faeries, I wonder what I am doing wrong! Yes, that strong ambiguity is interesting, isn’t it. I wonder why that is. It’s surely right to have a healthy respect, though, as you say. Perhaps your lack of faery encounters proves that you are approaching Nature in the right way: the Queen of the Fairies hasn’t felt the need to visit you, as you don’t need to be taught a lesson! I love reading your wise words about plants. another connection between Scotland and Oregon! our hawthornes are blooming away…. What a happy coincidence. I thought your hawthorn would be finished blooming by now, though I believe you had a late spring in general this year? We had visitors from Oregon a few years back. They found it very strange, seeing all our familiar vegetation (Douglas firs, redwoods, rhododendrons etc.) in an unfamiliar context (the folded corners of the Scottish landscape). If ever there was a disjunction between the look and scent of a plant this is it. Ours is all over now, so glad to get a second chance to see the blossom here. I have a small something for you that might cheer you up a bit. Can you email me at occasionalscotland at yahoo dot co dot uk? That is if you don’t mind blowing your cover – I promise to safeguard your identity! Failing that, I could hand it over to you next time you’re in Edinburgh at a pre-arranged spot and you could still remain incognito. Linda, that’s incredibly thoughtful of you. I’ll email – easier than donning a false moustache! Many thanks. Hedgerows *are* interesting, I agree. You can estimate the age of a hedge from the number of species growing in a given area, for example. Coming home from my first visit to Ontario as a child, I was very struck by how tiny our fields seemed back in Scotland, the countryside cross-hatched with trees and hedges. Thank you so much for your permission. I will certainly acknowledge your copyright! Our readers very much enjoy hearing a bit about the people whose photos we’ve used. Is there anything I can say apart from giving them your website? (eg where you are from etc) It’s not to be intrusive, just that many people have commented on how much they like to hear about people outside our own parish. If you want to know, our magazine covers three parishes in Durham in the North East of England. If you would prefer to email me, let me know and I’ll give you my address.